All New Daylite Integration and Forward to a Friend Features! 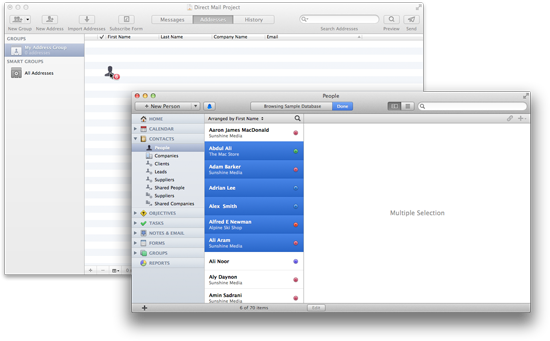 Update: Direct Mail 3.4 is now available in the Mac App Store. Just in time for the holidays, we’re happy to announce a brand new version of Direct Mail (3.4) that delivers two oft-requested features: Daylite 4 integration and a “forward to a friend” feature for sharing your emails. Read on for more information, and be sure to download the update today! Mac App Store customers will need to wait a bit longer, as Apple is still reviewing the update. We are big fans of Daylite and know that many of our customers rely on Daylite and Direct Mail to stay in touch with their clients and customers. Although Daylite 4 (launched earlier this year) did not initially support third-party integration, it has recently been updated to support integration with Direct Mail. We’ve worked hard to make integrating with Daylite even easier than before—you don’t even need a plug-in! You will need Daylite 4.1 to support integration with Direct Mail. Instead of importing your contacts from Daylite each time, you can also set up Direct Mail to automatically sync with one or more of your Daylite Groups. Now it’s easy to manage your mailing list from inside Daylite and use Direct Mail for creating, sending, and tracking your email campaigns. Direct Mail will keep up-to-date with name, email address, and other changes you make inside Daylite. Please see this help article for more information on setting up syncing with Daylite. We think you’re going to love the integration between Direct Mail and Daylite. Please let us know what you think in the comments or via our support site. 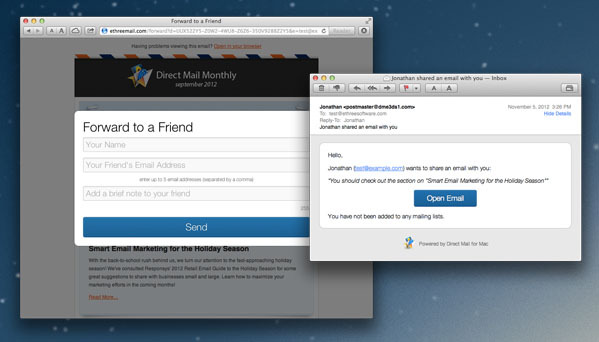 Direct Mail 3 has long made it easy for your recipients to share your email on Facebook and Twitter. Now we’re adding support for sharing via the original social network: email. Our templates in Direct Mail 3.4 now include “Forward to a Friend” links that your recipients can use to pass along your newsletter. If you use your own templates, you can add this functionality by including a link with the href set to “[forward to a friend url]”. You’ll be able to see when people share your newsletter by looking at the Links section of your history report (just like for Facebook and Twitter). We’ve also added a brand-new web-based API to Direct Mail 3.4. This makes it possible to add, remove, or update your Direct Mail mailing lists from other web-based applications—even when your computer is turned off. Please see our API documentation for more information. Another addition is a new bulk-edit feature. Now it’s easy to edit the contact information (like correcting the spelling of a company name, for example) for several addresses at once. We hope you like these new changes in Direct Mail—be sure to check out the recently updated Stamps for iPhone (and now iPad), too! We are already hard at work on some exciting new changes to be announced in the new year! Read the release notes or get the update today!